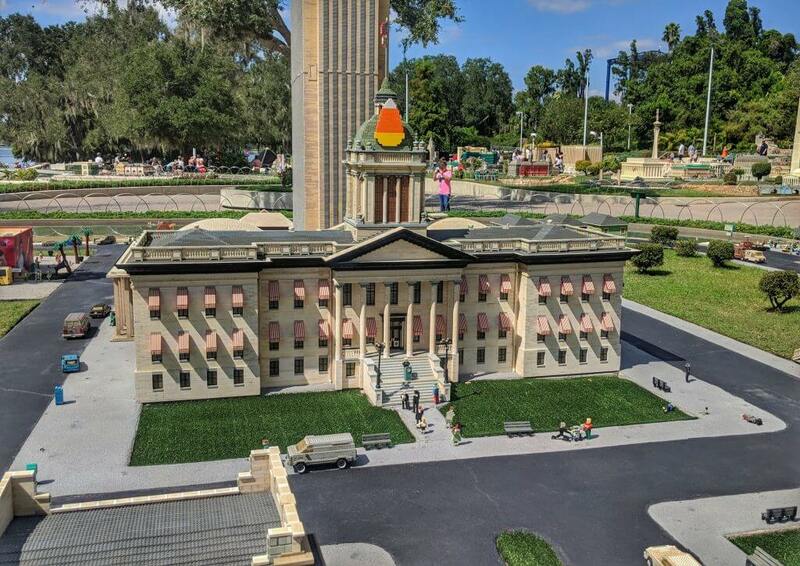 I’ve written a number of times about how much we adore Legoland Florida, and why we return so often with our kids (read my reviews of the Legoland Florida Water Park and the fantastic Legoland Star Wars Weekends). This past weekend we were lucky enough to go back for their annual Legoland Florida Brick or Treat Halloween event, and as always, had such a fantastic time! There were so many fun things for the kids to do, including meeting Lego characters, Lego brick builds, dance parties, fireworks, and of course, trick or treating! My favorite thing about this event is that it happens during the day, so families can bring young children without worrying about keeping them up past their bedtimes. As much as I love Mickey’s Not So Scary Halloween Party, what bothers me most about it is that the majority of the events occur well after my young children would normally be in bed, and it’s a rush to get everything done before they fall asleep! With the Brick or Treat event, we didn’t feel that same urgency to get everything done early on, and had a much more relaxed time. 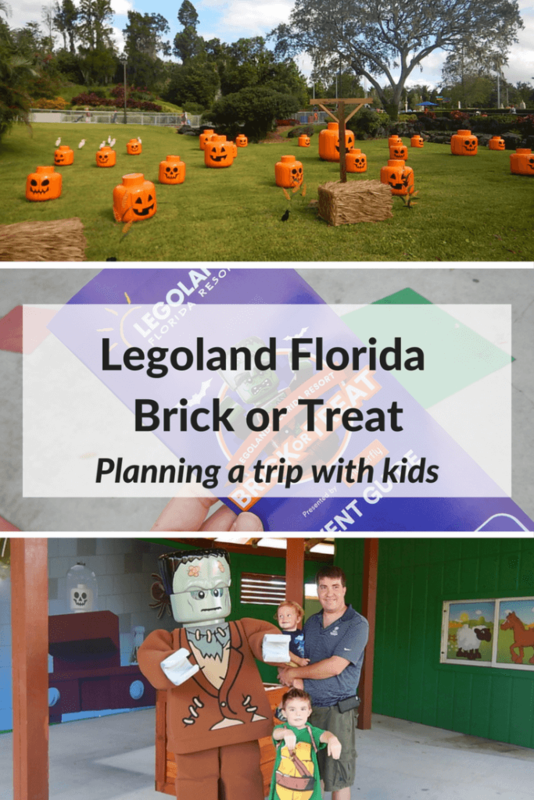 Read ahead to find out why I would absolutely recommend visiting Legoland Florida Brick or Treat with kids! 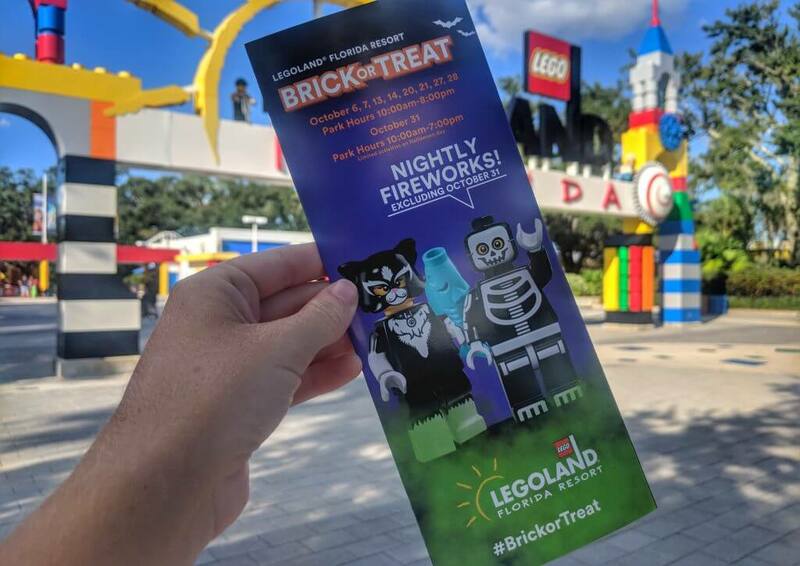 The Legoland Florida Brick or Treat event runs select weekends in October; this year, those weekends are the 6th/7th 13th/14th, 20th/21st, 27th/28th, as well as Halloween itself, October 31st. All of the fun of the event is included in regular park admission, although there are VIP Experiences available too. All of the activities run each weekend, except the fireworks, which are not performed on the 31st. The Brick or Treat events begin at park opening, and times for things like the character meet and greets and the shows can be found on the park map (the trick or treating begins at 2pm for Annual Pass holders and 3pm for other park guests, finishing up for everyone at 7pm). Kids are encouraged to dress up in costume for the event, although it is not mandatory, and we saw plenty of kids both in and out of costume. Bear in mind of course that this is Florida, and since the event happens during the day, it can get HOT! You can find out more by downloading the full event guide here, which is also available upon entry to the park. The main reason we love Legoland Florida so much is that my husband and eldest son, Harrison, are huge Lego fans. They can both sit for hours building something intricate that I wouldn’t ever have the patience to complete (my toddler and I play with the Duplo blocks instead!) 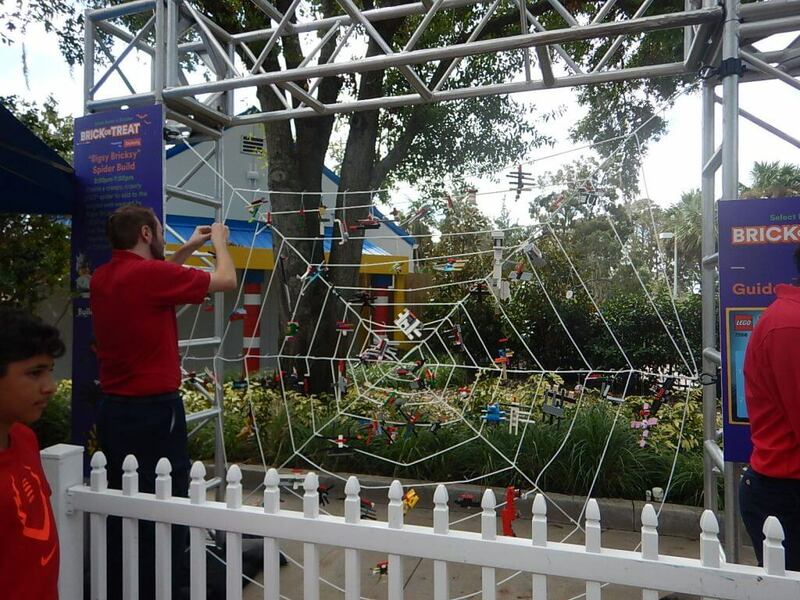 One of the cool things about Legoland special events is that they usually have Lego blocks to build with; in this case, you could be part of different Halloween-themed Lego builds, including build a Lego spider to be hung on a huge spiderweb. Harrison absolutely loved building his Lego spider and seeing it hung on the web, and had a great time adding to the Halloween mosaic. While there were some directions given, the thing I loved most about this was that it allowed kids (and adults – I saw plenty of them building Lego spiders!) to really use their imaginations and run wild with their designs. They were free to create whatever they wanted, to be creative and have fun, and really, that’s what I think Lego is all about. If you own any of the Lego City books or have seen any of the movies, then you might be familiar with some of the Lego Halloween characters! The Lego Witch, Frankenstein, Mad Scientist, Mummy, Lord Vampyre and the Spider Lady were all available for meet and greets at various times during the day, with each set lasting about 30 minutes. We found that the earlier sets were a little less crowded, but the later ones were busier as the crowds grew, forming lines well before the characters were due to meet. I would recommend picking a favorite character and meeting them first, then hitting the other meet and greets as the day progresses. I thought my kids might be a bit intimidated, if not downright afraid of the characters (they’re pretty big!) but the characters were really friendly and did a great job with them. Even my toddler, who screamed bloody murder when he met Mickey Mouse, gave them a tentative high five. Character greeting locations and the times of their sets can be found in the event guide. As well as the character greetings, there were spots to have your picture taken with an amazing Lego pumpkin (so big that you could climb into it!) and a Lego Hearse. Photographers were available to take your photo, and photos were available for viewing and purchase at the entrance (although you are welcome to use your own camera as well). At the Lego Batman Movie Days and the Legoland Star Wars Weekends, there were scavenger hunts around Miniland that Harrison really enjoyed, and I loved them too, since it forced you to notice all of the incredible little details of that area that you may not normally notice. I was really excited to read that the Brick or Treat event had a scavenger hunt too! We picked up our scavenger hunt guide at the Lego Studio Store, and we had to search Miniland for the giant candy corns. It took us a while to find everything – either we were distracted by all of the other cool aspects of the land, or it was actually pretty tricky! – but we managed to find all of the parts and returned our guide back to the Studio Store. Upon completion, we were given a commemorative Lego brick with Lego Frankenstein on, which is a really cool souvenir from our day. Our completed form was also entered into a drawing for an additional prize but honestly, the Lego brick is cool enough! This year Legoland Brick or Treat offered up some Halloween-themed snacks that we were more than happy to sample. These included Halloween Rice Krispie treats, Dirt Cups (chocolate pudding topped with crushed Oreos, whipped cream and gummy worms), a Pumpkin Spice version of their famous Granny Apple Fries, and our personal favorite, the Pumpkin Spice soft serve ice cream from Kingdom Cones. This vanilla soft serve ice cream had just a touch of pumpkin spice so it wasn’t too overwhelming, and it was the perfect Halloween treat on a warm day. 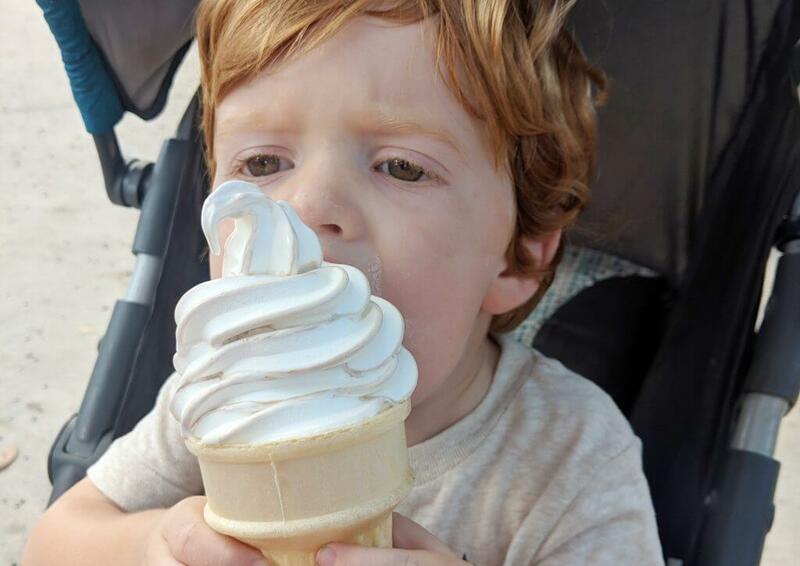 As you can see, Grayson loved this so much I couldn’t even get a photo before he wanted a bite! 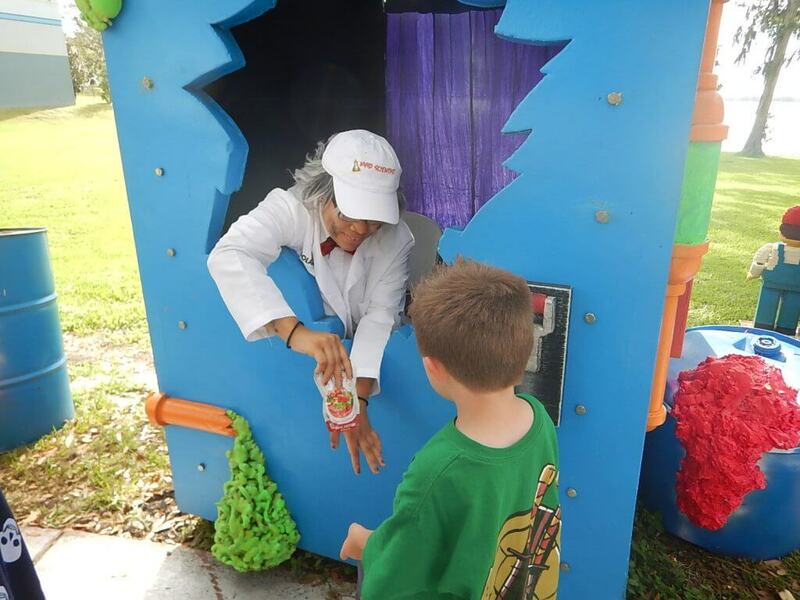 For most kids, Halloween is all about the candy, and Legoland Florida Brick or Treat had a really cool candy trail. The trail opened at 3pm (as I said, Annual Passholders were allowed to enter at 2pm), and ended at 7pm; we found that the line looked long for the majority of the day, but actually moved relatively quickly, and we were in and out within about 15 minutes. At the beginning of the trail, each child is handed a bag to collect their goodies, and our bag was completely full by the end of the trail! Along the trail, there are various themed houses with Model Citizens (Legoland team members) dressed in corresponding costumes (a pirate in the pirate-themed house, a mad scientist in a laboratory-themed house, etc) handing out candy and other goodies. We received handfuls of everything from Jolly Ranchers to Twizzlers to lollipops, as well as juice pouches (which were very welcome after waiting in line in the sun! ), Kettle chips, yogurt and granola bars. Harrison actually isn’t a fan of candy at all, so he loved getting the juice pouch (he was so excited to get one that he was offered a second one!) and was happy to save the candy to hand out to others on Halloween. This was Grayson’s first real trick or treat experience and while he was hesitant at first, he quickly got into the swing of it and ended up loving approaching the houses to ask “trick or treat!” It was also nice for him to have some treats besides candy since he’s too young to eat more chewy candies; he loved the yogurt and the chips especially. The whole trail is themed, with amazing fields of Lego pumpkins and a meet and greet opportunities with Willa the Witch. It was a really cool experience, and really convenient to have all of the trick or treating in one area. Having two kids five and under in our party, they were exhausted by 6pm and ready to head home, so we missed some of the cool after-dark experiences of Legoland Florida Brick or Treat. There is a monster bash dance party with music, dancing, lights and bubbles, as well as the Jammin’ Jack-o-lanterns, who come alive to sing your favorite spooky Halloween songs! As previously mentioned, every night except Halloween features the grand finale, the amazing Legoland fireworks. If you’ve never seen these fireworks, they’re really cool; you’re given special 3D glasses that make each firework look like bricks exploding in the sky! Harrison is obsessed with them, and is often disappointed when regular fireworks don’t do the same thing! They are the perfect way to finish up your day. 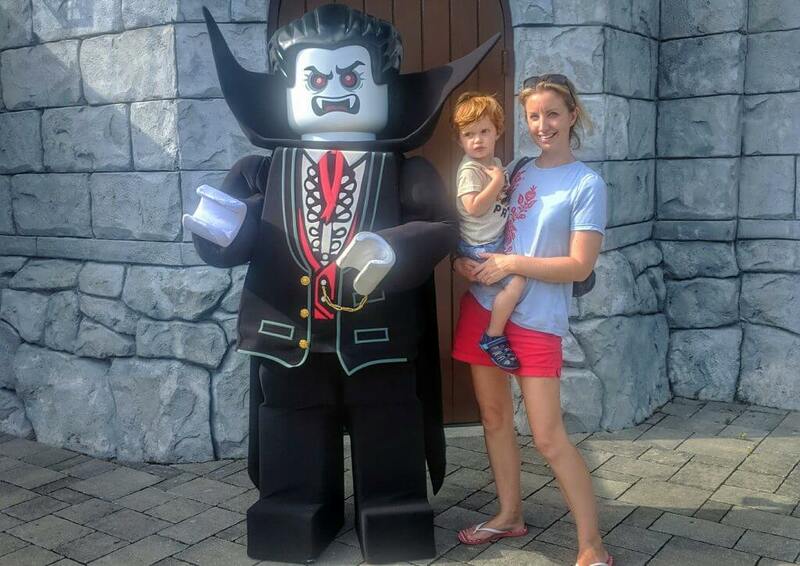 This was our first time at Legoland Florida Brick or Treat, and we loved it so much, it will definitely be a fall tradition for our family for now on. You can find out more on where to buy tickets on the official Legoland Florida website. 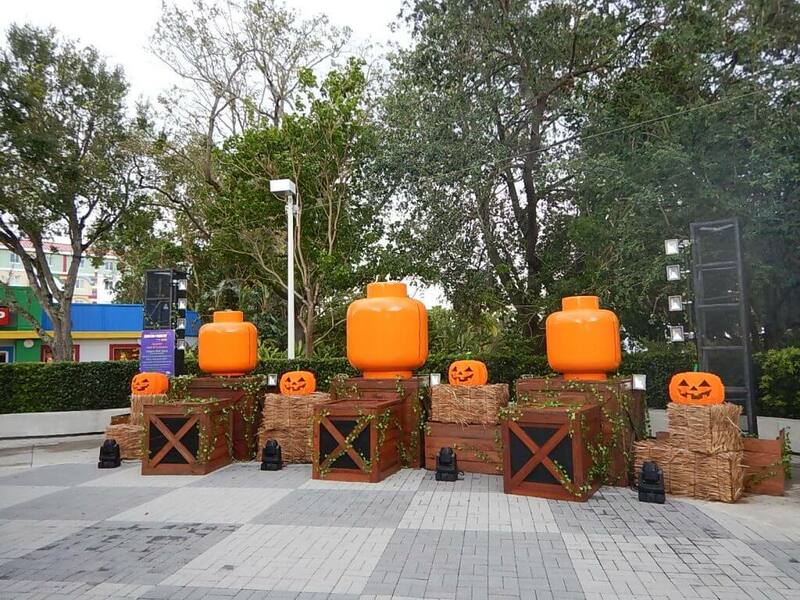 Have you ever visited Legoland Florida Brick or Treat? How did you enjoy it? Let me know in the comments! Many thanks to Legoland Florida for hosting us on this visit. As always, all opinions are my own. this looks really, fun and totally kid friendly! I wont be to Orlando until after Halloween so maybe next year!